Ask your sales team what they think about Customer Relationship Management (CRM) systems and it’s hard to imagine them professing their undying love for such a tool. That’s probably because their past relationships with CRM’s have been ‘complicated’. To successfully implement a CRM system your team also need to LOVE it. Exsalerate was built from an ‘actual’ business need it’s been engineered to be simple to use and easy to integrate into your daily routine. How many sales managers ask this question - What are we closing this month? Exsalerate’s visual pipeline enables management to see exactly where each opportunity is at, and the next activity the team has planned to win the business. It also tracks key KPIs and sales targets at an individual level to help you manage your teams performance. Think of Exsalerate as a hub where all lead/customer information is stored. Your team can prioritise their day, be reminded to follow-up on leads and be recognised and rewarded in real time for closing deals. They can also nurture existing relationships and identify new opportunities all within Exsalerate. Connect WorkflowMax to easily manage workflow, budgeting, time and profitability, then complete the picture by integrating Xero and you’ve suddenly got an enterprise solution at a fraction of the cost. Who is your most valuable customer and when did you last interact with them? You would be surprised how many managers or business owners can’t answer this question. Exsalerate automatically groups customers into 4 columns based on how long it’s been since your team last contacted them. The reason we created this dashboard is because it's more likely someone will remain a long term customer if they hear from your company regularly and feel the LOVE they deserve. We know it costs 5 x more to win a new client than it does to retain an existing customer, so if you want to grow your business it’s vital you nurture relationships and communicate effectively across your team, to do this everyone needs access to the latest information. Exsalerate visually displays comparative sales graphs across three key periods for each of your clients, Month to Date, Year to Date, and the Last 12 Months, so it’s simple for your team to see if their customers are spending more or less when compared to the same period last year. This tool has helped Stephen Doedens and his team at Newfound Distributors Ltd become proactive rather than reactive in the way they engage with their customers by leveraging real time sales data. Doug Hana and his team at Terribyte have identified additional opportunities with existing clients to drive revenue and profitability in a competitive industry. Businesses that have a sales process convert up to 35% more leads than companies who don’t. Exsalerate provides you the tools to create and embed a sales process that’s repeatable and scalable, so your team have a clear framework to follow. Exsalerate highlights leads that are taking longer than expected to progress through your pipeline or don’t have a future activity planned to follow-up so you can deploy resources proactively and effectively. When Opportunities are won users can add the company to WorkflowMax, assign a job to the correct team member and template all from within Exsalerate. Exsalerate automatically imports quotes sent to existing customers from WFM to a predetermined phase within your sales pipeline, and assigns an activity for follow up, thus reducing data entry and freeing up your team to focus on what’s really important. For the 24-strong team The Utility Company in Auckland, Exsalerate has solved a real business problem. Exsalerate provides a beautiful To-Do list that your team will LOVE, combining activities with leads/prospects and customers in one easy dashboard so everyone is working from the same page. Users drag & drop activities to reorganise their day, assign activities to other team members and every time an activity is completed Exsalerate prompts the user to create their next interaction with the company. Stephen Pilcher from VTG Waste & Recycling Ltd has found the To Do List to be his new best friend. You can also set activity based KPI’s for each user so you can see exactly who has done what across your team in order to motivate, recognise and reward your high achievers. Send leads directly from your website via custom webforms to your Exsalerate sales pipeline with a follow up activity assigned to a specific user. This saves valuable time and ensures no potential sales opportunities fall through the cracks. Some employees spend up to a day creating reports for management about what’s taken place the previous week? Exsalerate gives your team this time back, with a click of a button you can make insightful decisions armed with real time sales data reports that can be filtered and manipulated based on your business requirements. The power of Exsalerate’s integration with WFM means you track the lifetime journey of your customers from when they first enter their details on your website’s contact page, through your sales process, prospecting, quoting, winning the business, and how long it’s been since your team connected - like a hub of information every touchpoint is recorded in Exsalerate + WorkflowMax. Mark Ealam from The Skool Loop App Ltd sums it up. 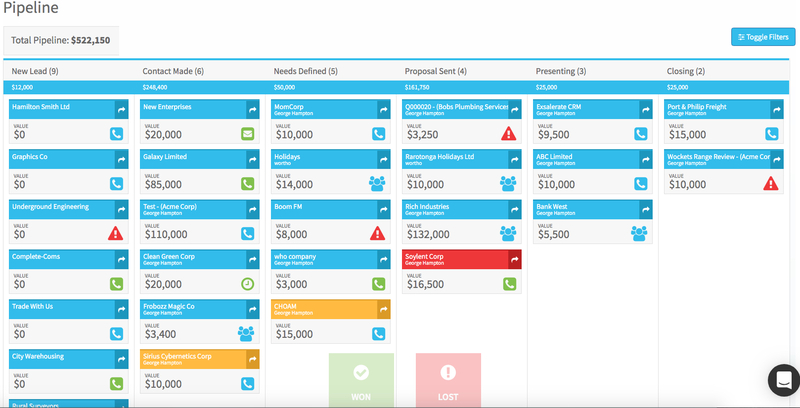 The question is what's not to LOVE about Exsalerate + WorkflowMax!? To learn more about how Exsalerate works with WorkflowMax check out this quick demo or visit the Exsalerate website to start a free trial.